The Counselor, a deathly thin saint-in-the-making, shuffles through the drought-wrought backlands of northern Brazil in the twilight of the 19th century. He accumulates a following of the wretched, the morally despicable, and the blindly pious. The size of his troupe swells to his magnetic aura, and he decides to settle them at an abandoned ranch on the property of a monarchist baron. God’s laws govern the settlement, called Canudos. Money, the census and civil marriage are not allowed, land and property are distributed equally, class and castes do not exist and anyone willing to devote herself to His word is welcome. Canudos becomes the second largest settlement in its state. It is a model libertarian utopia, gives hope to the poor and a second chance to freed slaves and criminals, and is, of course, destroyed shortly thereafter by an ungodly brutal military campaign in the name of Brazilian national unity. The dates, deaths, and many of the events and characters that populate The War of the End of the World are (mostly) historically accurate. ** Canudos actually existed — in all its radical and fanatical glory. This month, Picador released a new edition of the novel, which initially appeared in Spanish in 1981, and in English in 1984. It’s masterful handling of eternal themes like truth, freedom and God could make it relevant through the coming centuries. 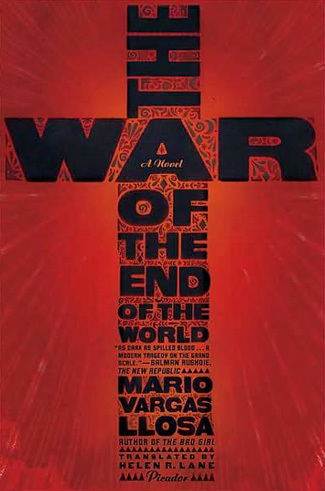 But for readers whose points of reference are embroiled in an age defined by globalism and terrorism, End of the World is most importantly a book about politics and war. Like Gillo Pontecorvo’s 1966 film, The Battle of Algiers, The War of the End of the World serves to remind a modern audience how the US could be rendered so utterly impotent in places like Afghanistan and Iraq. A well-equipped and trained national fighting force finds its technological advantages and conventional military prowess useless when it arrives to find an enemy hidden among unfamiliar terrain, skilled in guerrilla warfare, with the complete support of the local populace and a fundamental belief that they are fighting against the Devil — this is also the plot of Llosa’s novel, but the similarities between Canudos and Baghdad don’t stop there. The pretexts for Brazil’s attack came in the form of conspiratorial alliances between Canudos and the English empire, invented by politicians and fed to the public via the media, to whom they presented a myriad of dubious evidence. Brazil considered Canudos uncivilized, was abhorred by its by-all-means tactics, and exuded the attitude that they were saving the brutes from themselves. Pangs of Iraq 2003 jump out from the text in all directions. The War of the End of the World casts a grim shadow against the glaring stereotype that Sixties-era South American fiction was all magical realism. Arguably Llosa’s masterwork, it is a tremendous building block in the legacy of Spanish-language literature.